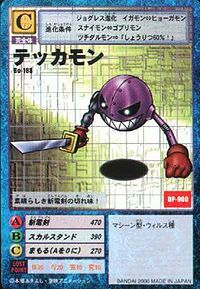 n., Short for tekkamen 「鉄仮面（テッカメン）」 meaning "iron mask". 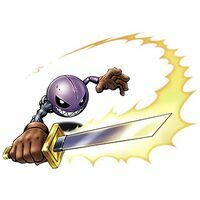 Zandenken  Slicing Electric Sword 斬電剣 N/A Strikes with its electrified sword. フラグメントボム Furagumento Bomu Spins around and self-destructs. 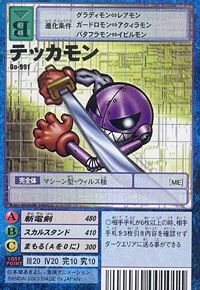 スカルスタンド Sukaru Sutando Creates a skull and throws it at the enemy. 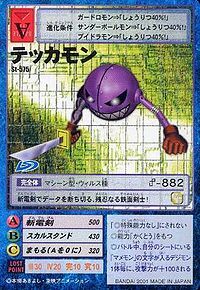 Tekkamon is an unobtainable enemy digimon. Tekkamon is an Adult in this game. Tekkamon is an obtainable Digimon. Evolves from Nanimon (0+ DP) and can evolve to Piemon (0+ DP). Evolves from Omekamon. Can be evolved to Pinocchimon. This cruel, iron-masked swordsman slices through data with its Zandenken! Its Zandenken boasts superb sharpness! This page was last modified on 9 October 2018, at 04:50.